Home › Home and Kitchen › Idaodan 0.01Oz To 11Lbs Digital Display Kitchen Food Scale For Precise Cookin..
Idaodan 0.01Oz To 11Lbs Digital Display Kitchen Food Scale For Precise Cookin.. ACCURATE - Easy-to-use digital kitchen scale weighs up to 11 lbs. (5050 grams) in precise graduations of 0.01 oz. (1 gram); Cleans and stores easily. MULTIPLE UNITS - Automatic Unit Button instantly converts between 5 units (g, oz, lb:oz, lb, ml) and displays results on the LCD screen. TARE FEATURE - Calculates the net weight of your ingredients (automatically subtracts the weight of any bowl or container). ENLARGED LCD SCREEN - The digital kitchen food scale features a large LCD Display which make it easy to read from different angles. Easy-to-use large buttons. BATTERIES INCLUDED - The digital food scale will come with 2*AAA alkaline battery which are long lasting and eco-friendly; Satisfaction Guaranteed. Stay on top of food portions and ingredients with a digital kitchen scalethat's designed to help you eat healthier meals. Proper portion control canmean the difference in living and feeling healthy, and being overweight,tired, lethargic and even ill. But thanks to the IDAODAN Digital KitchenScale, you can start keeping track of all your calories, fat intake, carbs,and so much more. Portable, durable and easy to use, the IDAODAN food scalehelps you make better decisions with your food so you can live a longer,healthier, happier life. Whether you're looking to enhance your New Year'swork out resolutions to eat healthier and work out more, or you just want tostart counting your calories to lose weight, our versatile scales will bethere to help you measure out your goals every day. Features and benefits ofthe IDAODAN Digital Kitchen Scale: • Capacity: 3g - 5000g • Division: 1g •Unit: g/lb/lb:oz/oz/ml • Power: 2AA batteries (Included) • Enlarged weighingplatform finished in elegant chrome • 2 large buttons that generate an audibleclick confirmation • Accurately Measures up to 11lbs within .05 oz. 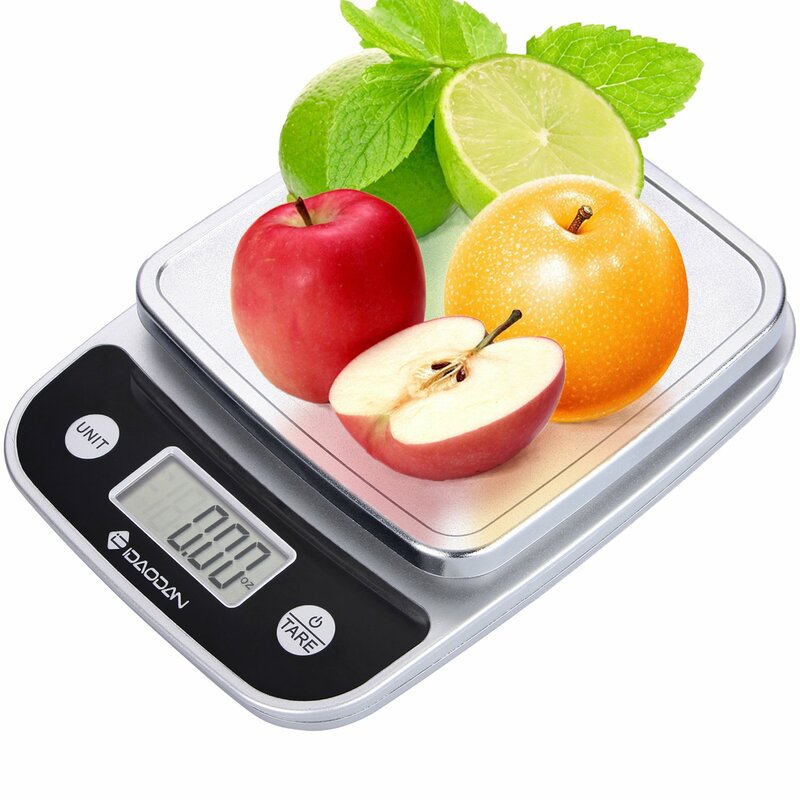 • CrystalClear Display • Food-Grade Safe Weigh Scale • Works on Liquids and Foods •Lightweight and Compact Click "Add to Cart" above and never let a calorieescape your diet plan! Please pay promptly via Paypal, and let us know if you have any questions!